While the photos aren’t up to par, cuz I am using iPhone and iPad cameras, the food is hot, bubbly delicious! Today it all begins with a rather easy version of Sausage and Okra Gumbo (recipe basics by Mark Bittman). But as you well know by now, I stray and a recipe evolves into a new masterpiece – or at least I would like to think so. Given that his recipe didn’t begin with a roux I was skeptical, but I begin there with a basic roux to bump up the gumbo factor. Simply put, flour and oil cooked to a deep brown nutty aromatic base for any good gumbo. Slowly stirred I like to get it darker than peanut butter, but not as dark as Nutella. From there one can use it all for a big pot of gumbo or just some for a smaller amount as it keeps for a while in the fridge. Since my Colorado gumbo evolved the only thing Louisiana about it was the fine lady from Louisiana at an unfamiliar market (Tony’s) that assisted me in finding a substitute for andouille which had been sold out. We discovered a Colorado Cajun Sausage made locally I think, or at least in the state of Colorado. I’ll have to let her know that it was a respectable choice and pretty good. The cooking aroma was enough to stop a bunch of baseball game bound people just to admire and at least one to “taste of it” as the say in the south. The addition of fresh home-grown tomatoes was nice, deep red, juicy and yes the skins were left on, who cares! The gumbo is ready and a last-minute addition of shrimp, not local, obviously, and a hot-pot of Chiqui’s Creole rice for a Colorado dinner night. I don’t have a standard recipe that I stick to for gumbo so it is always nice to expand the gumbo portfolio…beyond the basics add fresh bay leaves, thyme, oregano and okra, but in a pinch dried herbs and frozen cut okra will be just fine in the recipe. There are a few gumbo “starter kits” out there and there is no shame in using a good one if you are not confident enough to go it alone or want to supplement a pot of gumbo for extra unexpected company. When I get home, I plan to order from this recently added source reviewed by a friend. 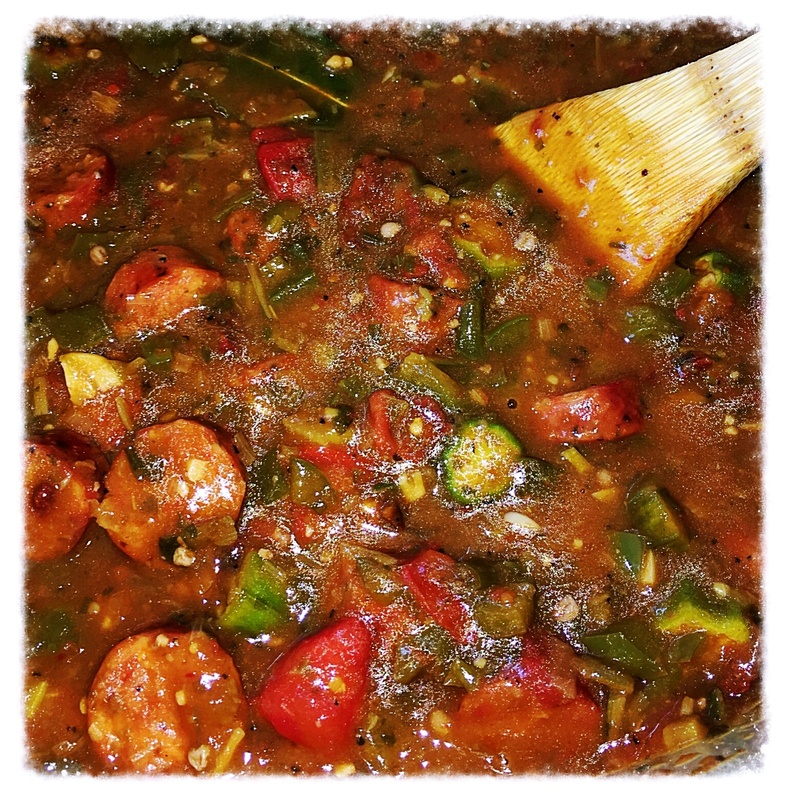 The Cajun Spoon Gumbo…link below.